Majority of lymphomas involving the kidney are of large B-cell type. The growth pattern is usually interstitial. 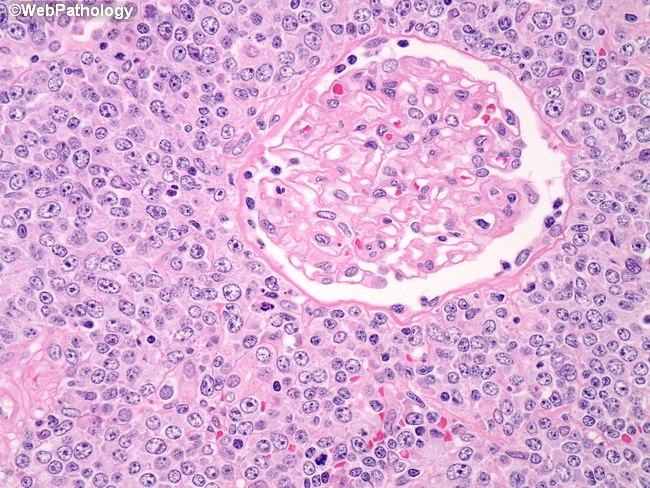 In this image, diffuse sheets of neoplastic B-cells completely surround glomeruli. In some cases, the growth pattern may be nodular or predominantly intravascular (intravascular lymphoma). Molecular genetics of diffuse large B-cell lymphomas (DLBCL): clonally rearranged immunoglobulin light- and heavy-chain genes, BCL2 rearrangement due to t(14;18)(q32;q21) in 20% of cases, BCL6 (located at 3q27) rearrangement with various translocation partner genes in 30% of cases, and MYC rearrangement due to t(8;14)(q24;q32) in about 10% of cases.